Once again we are taken on an adventure with Göran Borg and Yogendra ‘Yogi’ Singh Thakur, this time they take us from the bustling Delhi life to the mist-clad mountains of Darjeeling. Göran Borg is back on Swedish soil and back in his old tracks. The revolutionary trip to India and his love affair with Preeti feel little more than distant memories, and he struggles with a general sense of anxiety and failure. But soon it is time, finally, for Yogi’s marriage with the love of his life, Lakshmi, and Göran sees it as an excuse to leave town and some unresolved conflicts behind him. And Yogi is happy to see him and get some assistance with the big wedding preparations. To finance the wedding Yogi has bought a prosperous tea estate in Darjeeling for his father-in-law’s money and Göran goes with him to inspect it. But the seemingly easy deal with a quick refund turns out to be a con; there is indeed an estate, but in its state of decay it will not see profit any time soon. Yogi is defeated, without money he cannot marry Lakshmi, and he cannot return home to Delhi to his mother either. And Göran has to rush back to Sweden; otherwise he will lose his job. Once again, Göran lets the fear get the better of him. But what kind of friend is he to leave his best mate alone on a mismanaged tea estate to drink away his sorrows? At the airport Göran changes his mind and goes back to help Yogi, and together with the enterprising Lakshmi, who has travelled alone all across the country to see her beloved Yogi, they manage to turn things around at the estate and make their future look a lot brighter. Following the success with Dehlis vackraste händer, Mikael Bergstrand is back with a new entertaining and adventurous novel about prejudice and egoism, about getting out of old habits and about courage, loyalty and friendship. 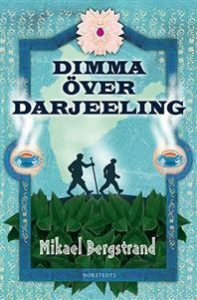 “‘Dimma över Darjeeling’ could easily be dismissed as pure entertainment. But to me, it points to a prevailing sorrow over the fact that I identify more with Borg’s fear of the uncomfortable, than with Yogi’s irrepressible hunger for life. So no matter how much feel-good this story wants to surround itself with, it is also a story about the anxiety that emerges when we try to protect ourselves from that very thing.